The 2016 version of the marker. On this property, owned by the Trustees of Richmond Academy, this building was designed by the distinguished Georgia architect, Charles B. Cluskey, for the use by the Medical College of Georgia. It was occupied by the Medical College from its completion in 1835 until 1912, when the College removed to Railroad Ave (today’s R. A. Dent Blvd). After removal of the Medical College this building was used for the manual training and science departments of the Richmond Academy until 1926. Location. 33° 28.236′ N, 81° 57.77′ W. Marker is in Augusta, Georgia, in Richmond County. Marker is on Telfair Street, on the right when traveling east. Touch for map. Marker is at or near this postal address: 598 Telfair Street, Augusta GA 30901, United States of America. Touch for directions. The original 1954 version of the marker. steps from this marker); Eve (a few steps from this marker); Richmond County (about 500 feet away, measured in a direct line); The First Presbyterian Church (about 500 feet away); a different marker also named The First Presbyterian Church (about 500 feet away); Army National Guard (about 500 feet away); General George Washington (about 500 feet away); The Signer's Monument (about 500 feet away). Touch for a list and map of all markers in Augusta. Regarding Medical College Building. This marker replaced a previous marker erected in 1954 by the Georgia Historical Commission with the same title and number. 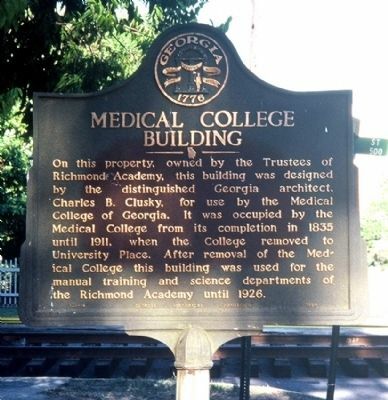 The first marker that stood near this location read “On this property, owned by the Trustees of Richmond Academy, this building was designed by the distinguished Georgia architect, Charles B. Cluskey, for the use by the Medical College of Georgia. It was occupied by the Medical College from its completion in 1835 until 1911, when the College removed to University Place. 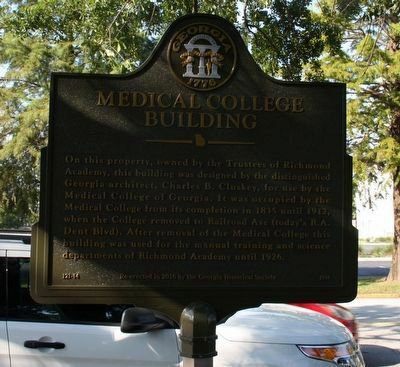 After removal of the Medical College this building was used for the manual training and science departments of the Richmond Academy until 1926.” The present marker corrects the location where the College moved to in 1912. More. Search the internet for Medical College Building. Credits. This page was last revised on August 28, 2017. This page originally submitted on October 18, 2009, by David Seibert of Sandy Springs, Georgia. This page has been viewed 866 times since then and 3 times this year. Last updated on August 25, 2017, by Byron Hooks of Sandy Springs, Georgia. Photos: 1. submitted on August 25, 2017, by Byron Hooks of Sandy Springs, Georgia. 2. submitted on October 18, 2009, by David Seibert of Sandy Springs, Georgia.